Journalist Luke Zalesiński in the Polish daily newspaper, Rzeczpospolita, reports online today here that the National Museum in Poznan has found one of it's World War II looted paintings in Moscow but may have to buy it back before it is returned to Poland. (You can also find another blog, Poland.pl, that relayed this information in English here). 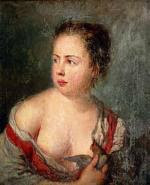 Antoine Pesne, a court painter of King Frederick II of Prussia, created "Girl with a Dove" in 1754. The National Museum of Poznan purchased it from a private collector. In 1943, the Germans ordered the evacuation of the museum and sent art to eastern Germany where they were later taken by the Red Army. Only a portion of the collection was returned after the war. Piotr Michalowski, director of the National Museum in Poznan, has identified the painting with photographs made before the war and reports that the painting has suffered some damage. Negotiations by the Ministry of Culture for the return of the painting have been ongoing since last summer. Polish museums and private collectors lost about 70 percent of material heritage such as paintings by Raphael, Brueghel, Van Dyck, Malczewski, Kossak, and Gierymski, according to the cultural ministry. "Today it is difficult to determine what proportion of stolen cultural property returned to the country as a result of post-war restitution share," according to article (as translated from Polish to English). The Ministry of Culture's stolen art database has 60,000 records, but "but often one entry refers to several items that were listed once under the same inventory number." Poland's Ministry of Foreign Affairs, according to the article, has a team trying to recovery cultural property and searches major auction houses for images of stolen art. The article cites two examples: The National Museum in Warsaw recovered "Adrieana Brouwer's "The peasants in the tavern" when it was put up for sale at Christie's in London in the late 1990s, according to the article. By the time the museum identified the painting, it had been sold to a London art dealer who had sold it to someone in France. The London art dealer, Johnny van Haeften, repurchased the painting and returned it to Warsaw. Alexander Gierymski's painting, "Jewish and oranges", was found in a Germany auction house last year and negotiations are ongoing for its return. "Good faith" laws protecting the purchasers of art from claims of stolen property in many countries create barriers for the return of looted art. Photo: "Girl with a Dove" image from the National Museum of Poznan. Four years ago on February 27, 2007, Pablo Picasso's granddaughter reported the early morning theft of two Picasso paintings worth 50 million euros from her Paris apartment. At about 4 a.m., two paintings had been removed from the Left Bank apartment of art historian Diana Widmaier-Picasso on rue du Grenelle in the 7th Arrondisement. "Maya and the Doll" (Maya a la poupee), is a 1938 portrait of her mother, Maya Widmaier, the daughter of Picasso and Marie-Therese Walter, the artist's companion from 1924-1944. "Portrait of Jacqueline" was painted by PIcasso in 1961 the year he married his second wife, Jacqueline Roque. The theft also included a lead pencil drawing and collage on paper, "Marie Therese at 21 years". Widmaier and her mother were awoken by a noise, went downstairs, and having noticed nothing, returned to bed. They noticed the missing paintings later that morning. Thieves had neutralized the alarm and had either used the code or the keys to enter the second floor apartment. One painting had been sliced from its frame and another had been removed from the wall although newspaper reports differ as to what happened to each painting. 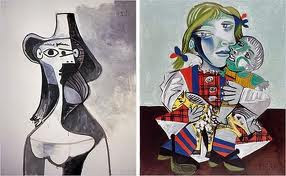 Pablo Picasso, who died at 91 years of age of a heart attack in 1973, is one of the world's most popular artists. His 1905 "Garcon a la pipe" sold for $104.2 million at Sotheby's in 2004. After Picasso's death, his heirs divided up his paintings. The Organized Crime Unit of Paris police investigated the theft. In 1976, one of France's largest art thefts, involved the robbery of 118 paintings, drawings, and other Picasso works from a museum in Avignon. Picasso works were stolen from Zurich in 1994; from London in 1997; Rio de Janeiro; and the Pompidou Centre museum in Paris. In 1989, 12 Picasso paintings were taken from the Cannes home of Marino Picasso, another of the artist's granddaughters, and later recovered. In August, within six months of the theft, Paris police had recovered the two paintings and arrested three people for the robbery which they had had under surveillance for more than a month when a suspect took the rolled-up paintings to a potential buyer. Photos: "Portrait of Jacqueline" and "Maya and the Doll"
One of the reasons I miss Amelia has nothing to do with pizza, gelato or art crime: Giampiero Novelli. Since my first walk through the open shops of the medieval center of Amelia, I would greet the man standing in front of the shoe store. He had a friendly smile and a quick cheerful "Ciao Ciao" which he accompanied with a wave. After seeing him sell tickets to the wine tasting festival, helping out at the dining room of Punto Divino (and sometimes in the kitchen), and organizing the medieval festivities in August, I understood that not much happens in Amelia without Giampiero, his wife Paola, and his brother-in-law Luciano Rossi (proprietor of Punto Divino) and Luciano's wife Manuela. Giampiero's English is better than my Italian, but I asked his niece, Francesca Rossi, our correspondent in Amelia, to pass on a few questions to her uncle. ARCA blog: Giampiero, how long have you lived in Amelia and are you happy living in this historic town? 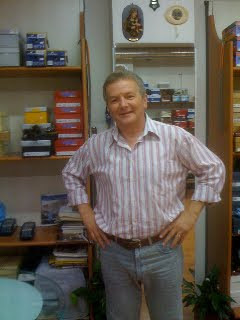 Giampiero: I'm living in Amelia since 60 years ago...which means since I was born! And I'm really happy to live in here! ARCA blog: You have a fantastic selection of shoes for men, women and children. What is it like to be a small businessman in Amelia right now? Giampiero: Even if we're going through a difficult period, this is still a job full of satisfaction and also, after 30 years doing that, there is also an affection and a devotion to the shoe business that is stronger than everything. ARCA blog: As I've told our readers, you don't just operate a shoe store. You are involved in just as many activities as the mayor of the town. Have you thought of going into politics or do all your activities keep you too busy? Giampero: Absolutely not! I like to be involved in volunteering roles to make a better Amelia and to improve the hospitality here but I'm really not interested in being a politician. (After pausing to think, he continued) See, in this moment I am both Prior of my "contrada" and President of the traders' association in town and you know what? Actually it's sort of like being in politics because you have to deal with all the institutions and politicians in town and obviously this give you a certain influence in making decisions. ARCA blog: Giampiero, many of our readers are learning about Amelia for the first time through our art crime blog. What would you advise someone about visiting Amelia for the first time? Giampiero: Well...I would suggest a visit to our Museum and obviously Germanico; the Ancient Walls; the S. Magno Monastery with its unique organ; the Cathedral; the Roman Cisterne; the Theatre; and none the less, take your time for a gastronomic itinerary to taste our food and wine specialties! Editor's note: A contrada is a district, or a ward, of a medieval Italian city. Historical Amelia is divided into five contrade. The Journal of Art Crime: Noah Charney Reviews "A Real Van Gogh: How the Art World Struggles with Truth"
In the fourth issue of The Journal of Art Crime, Noah Charney reviews Henk Tromp's book, "A Real Van Gogh: How the Art World Struggles with Truth" (Amsterdam University Press 2010). "The art world wants to be trick," Noah Charney writes. "That is certainly the conclusion one comes away with after reading A Real Van Gogh, Henk Tromp's thoroughly researched, highly readable, fascinating new book, which uses the history of van Gogh authenticity and forgery debates to discuss what happens in the art world when someone cries wolf. It's not a pretty picture for the expert who deigns to proclaim a work inauthentic." 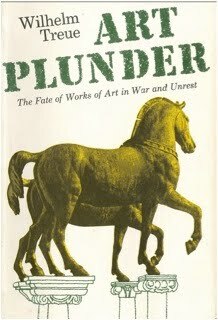 The Journal of Art Crime: John Kleberg reviews "Priceless" and "Stolen Masterpiece Tracker"
In the fourth issue of The Journal of Art Crime, John Kleberg reviews Robert K. Wittman's book, "Priceless" (Crown Publishers, New York, 2006), and Thomas McShane's book, "Stolen Masterpiece Tracker" (Barricade Books, New Jersey, 2006). Wittman's book is about his cases in art crimes investigations with the Federal Bureau of Investigation (FBI). McShane, also a retired FBI agent, reports on various international undercover criminal investigations during his 25-year-career with the FBI. Wittman was with the FBI office in Philadelphia; McShane was with the FBI office in New York. Both men take credit for either inspiring or creating the FBI's Art Crime Team which was established in 2004 and is today coordinated in Washington as the Art Theft Program, according to the reviewer. Bangkok Post Features Julia Brennan in "Conservation Crusader"
Today [February 24], Bankok Post features an article on ARCA's 2009 Alum Julia Brennan in an article titled "Conservation Crusader." 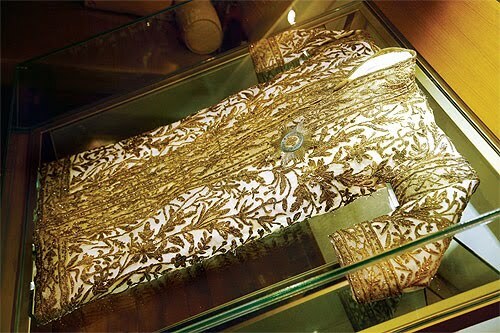 "... the conservation of the ceremonial robe presented by King Chulalongkorn to Phraya Cholayuth Yothin, otherwise known as Vice Admiral Andreas du Plessis de Richelieu, a Danish navy officer who became the first and only foreigner to take command of the Royal Thai Navy at the beginning of the 20th century. The robe had been in the possession of the admiral's grandson, who put it up for auction in 2007. This was when it caught the attention of Anders Normann, the consul general of Denmark in Thailand, who hoped to return the robe to its country of origin." The article includes an interview with Julia where she describes how to handle the conservation of this robe and the robe's current owner. Fascinating read! The Journal of Art Crime: Douglas L. Yearwood Reviews "Crimes of the Art World" and "Art and Crime: Exploring the Dark Side of the Art World"
In the fourth issue of The Journal of Art Crime, Douglas L. Yearwood reviews Thomas D. Bazley's book, "Crimes of the Art World" (Praeger Press 2010) and "Art and Crime: Exploring the Dark Side of the Art World" (Praeger Press 2009) edited by Noah Charney. "Drawing on the expertise of the book's 24 contributors, all of whom are renowned experts and scholars in their respective areas, Charney has produced the definitive text for those who are interested in the historical, sociological, criminological, and legal aspects of crime involving art and the art world." Douglas Yearwood is the Director of the North Carolina Criminal Justice Analysis Center. He has published articles and book reviews in Justice Research and Policy, the British Journal of Criminology, Criminal Justice Policy Review, the Journal of Family Violence, the American Journal of Police, Children and Youth Services Review, African American Male Research, the Journal of Gange Research, the F. B. I. Law Enforcement Bulletin, the Criminologist, Critical Criminology, Federal Probation, Police Chief, and American Jails. He is co-author, with James Klopovic and Michael Vasu, of the book Effective Program Practices for At-Risk Youth: A Continuum of Community-Based Programs. ARTINFO France reported today (Feb. 23) in an article, "Desperate Museum Guard Holds Renaissance Masterpieces For Ransom, Only to Have Them Stolen From His Car," that a security guard from Corsica's Fine Arts Museum in the Palais Fesch stole four paintings, submitted his ransom demand for housing through a local television station, and when he led police to his car, discovered that the window had been smashed and that the four paintings had been stolen from his car. 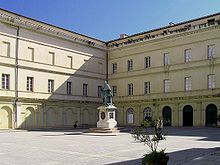 Mocellini had served as a security guard some 20 years at Ajaccio's Fine Arts Museum, an institution known to have the second-largest collection of Italian paintings in France, surpassed only by the Louvre. When he finished his shift on Saturday morning, he absconded with one French painting and three Italian Renaissance works from the famed collection: Poussin's "King Midas at the source of the Pactole River," Bellini's "Virgin and Child," Mariotto di Nardo's "Pentecost," and an anonymous Umbrian artist's "Virgin and Child." The Palais Fesch musée des beaux-arts, which reopened in June after a two-year 7 million euro renovation, houses one of France's most important art collections, second to the Louvre in Italian paintings. The four paintings, like most of the collection, were once in the Rome collection of Cardinal Joseph Fesch, one of the most important art collectors of his generation (1763-1839) and a Bonaparte supporter. During Fesch's lifetime, he owned 16,000 paintings, mostly Italian Renaissance paintings, and donated many works to his native city of Adjaccio upon his death. Unfortunately, each of the stolen works was the museum's sole representation of that artist at the Adjaccio museum. Nicholas Poussin's "King Midas at the Source of the Pactole River" is a 17th century French oil on canvas measuring 58 x 82 centimeters; Giovanni Bellini's "Virgin and Child" is a 15th century tempura on wood measuring 65 x 46,5 centimeters; Mariotto di Nardo's "Pentecost" is a 15th century tempera on wood measuring 47 x 28 centimeters; the "Virgin and the Infant in the glory of the seraphins" by a 16th century Umbrian painter is a tempera on wood measuring 53 x 34 centimeters. Photos: Clockwise: Poussin's "Midas"; Anonymous Umbrian Painter's "Virgin and the Infants in the glory of the seraphins"; Bellini's "Virgin and Child"; and Mariotto di Nardo's "Pentecost"; lower right is the Fresch Palais in Adjaccio, Corsica. The Journal of Art Crime: Noah Charney on "The Art We Must Protect: Top Ten Must-See Artworks in Belgium"
In the fourth issue of The Journal of Art Crime, ARCA founder Noah Charney writes about "The Art We Must Protect: Top Ten Must-See Artworks in Belgium." 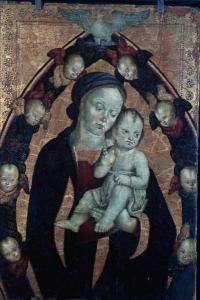 Mr. Charney proves history and context for the following artworks: Jean Fouquet's "Madonna and Child" at the Koninklijk Museum voor Schone Kunsten (Royal Museum of Fine Arts) in Antwerp; Hugo van der Goes' "Death of the Virgin" at the Groeninge Museum in Bruges; Jan van Eyck's "The Ghent Altarpiece" at the Sint Baafskathedraal (St. Bravo's Cathedral) in Ghent; Peter Paul Rubens' "The Raising of the Cross" at the Onze-Lieve-Vrouwekathedraal (Cathedral of Our Lady) in Antwerp; Hans Memling's "Shrine of St. Ursula" at the Memling Museum in Bruges; Hieronymous Bosch's "Christ Carrying the Cross" at the Ghent Museum of Art, MSK Ghent; the Palais Stoclet in Brussels designed by Josef Hoffman and Gustav Klimt; Rene Magritte's "Empire of Lights" and Jacques-Louis David's "Death of Marat" at the Royal Museum of Art in Brussels; and Paul Delvaux's "Nos Vieux Trams Buxellois" at the Bourse Metro Station in Brussels. In his column on February 3, 2011, "The Secret History of Art" for ARTINFO, Noah Charney highlights Fouquet's "Madonna and Child". On June 9, 2010, thieves broke into the Finnish Orthodox Church’s Uspenski Cathedral in Helsinki, the largest Russian Orthodox Church in Western Europe. The alarm went off at 2.16 a.m. By the time security arrived at the cathedral less than 15 minutes later, the thieves were gone, along with one of the spiritual treasures of the Finnish Orthodox Church, the icon of the Mother of God of Kozeltshan and pearls and other jewels worshippers had gratefully draped around the icon in gratitude for answers prayers. Early in the 20th century, St. John of Kronstadt in St. Petersburg had given this icon of Panagia to a wealthy Russian family in Finland who told them to say a prayer in front of the icon for their daughter’s recovery from an illness. When the miracle of health occurred, the girl’s mother donated the icon to a church and the continued decoration of precious jewels signified additional miracles. 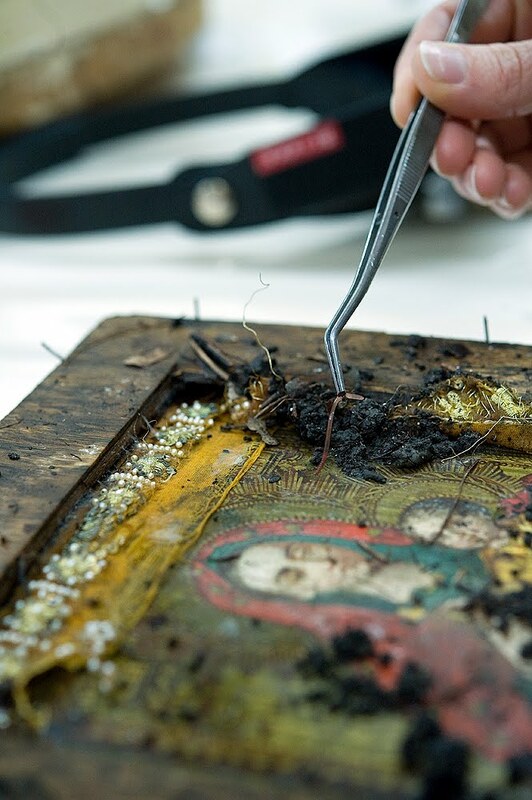 Thieves had also damaged another icon, breaking the protective glass around it, tearing away the decoration made of pearls, throwing them on the floor, and stealing its metal halo with precious stones. Apparently this icon was saved because of its size; it must have been too large for thieves to take with them. 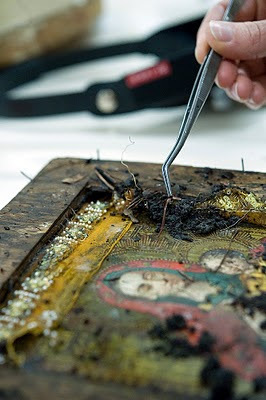 The damaged icon of St. Barbara was brought to me for conservation treatment few days later. Luckily, the damages were not too serious, but the halo was missing. Police were very doubtful that the icon of Mother of God of Kozeltshan could ever be found, assuming it had been taken away from the country immediately. In the autumn of 2010, the Uspenski Cathedral had unpleasant visitors again. Due to fast action by the police and security, this time the thieves were caught before they could steal anything. Later, one of these men, a Romanian, was found guilty in the June theft and sentenced to prison for two and half years and required to pay compensation of 180,000 euro. Months later, he decided to confess what he had done with the icon. The police said he must have had a bad conscience, since his confession would not reduce his sentence. On Monday, February 8, 2011, I received a phone call that nearly threw me off my chair. The police told me confidentially that they knew the location of an icon that had been stolen eight months earlier. They asked for advice on how to treat the icon, since it is likely buried in the ground. I could hardly believe what they told me, advised them on how to handle the icon, and received a promise that they would let me know what happened as soon as possible. The next day, the police called me again, this time they were on the spot, they had dug in the snow and found the icon in the ground, and asked me what to do next. When I heard that the icon was there without any kind of protection, that picture side was towards the ground, my heart jumped to my throat. What is left from an icon after it has spent six or eight months buried in the ground? I flew immediately to Helsinki to see the icon and to take it to our conservation department. My first sight of the icon made my hands shake, literally. A very strong smell of wet ground rose from the icon. It was covered with leaves, twigs, sand, and dirt. The icon had become a home for all sorts of insects and worms. What struck me was how the faces seemed to be so clean, almost glowing, in the middle of all that dirt, and how well the icon looked despite its fate. Two weeks have passed now, and every morning, when I take the icon from the cold storage, where it spends most of its time at the moment, and open the box, I feel the same amazement. The odor of wet dirt still overwhelms me when I open the box. The initial cleaning has been completed, but the most important thing is to wait and have patience to allow the icon to dry. This process takes weeks, if not months, since the drying-process must be very slow so that the wood does not get any more damaged from fast drying. If the wooden ground gets damaged, the paper layer of the painting will get damaged as well. To prevent the icon from drying too fast, the icon is stored in a cold storage, letting it breathe for a couple of hours daily. During these hours I am able to document the icon, and get more knowledge about the damages, and make plans for conservation. Patience is needed at this point, lots of it. Editor's Note: Readers can look at more photos on Riikka's blog at http://www.valamo.fi/fi/konservointi/konservointiblogi.html. The Journal of Art Crime: Patricia Kennedy Grimsted on "Reconstructing the Record of Nazi Cultural Plunder"
Dr. Patricia Kennedy Grimsted most recent publication, Reconstructing the Record of Nazi Cultural Plunder: A Survey of the Dispersed Archives of the Einsatzstab Reichsleiter Rosenberg (ERR), will soon be launched on-line by the International Institute of Social History (IISG/IISH) in Amsterdam . Issued in association with the Netherlands Institute of War Documentation (NIOD), with generous support of the Conference on Jewish Material Claims Against Germany (Claims Conference) it describes the archival remains of the ERR in 29 repositories in 9 countries – from Washington and Brussels to Moscow and Kyiv. Dr. Grimsted’s article “The Postwar Fate of Einsatzstab Reichsleiter Rosenberg Archival and Library Plunder, and the Dispersal of ERR Records,” appeared in the fourth issue of The Journal of Art Crime. Dr. Grimsted's new extensive international survey serves as a preliminary guide to documents generated by the ERR as well as records by postwar agencies seeking to return the ERR loot. Links are provided to many dispersed materials now available on the Internet or in microform. These include the recent efforts of the U.S. National Archives and Records Administration (NARA), the German Federal Archives (Bundesarchiv), and other repositories, with additional digital contributions expected soon, providing improved access to a major component of the record of wartime cultural plunder and retrieval. A discussion with Dr. Grimsted about her article, "The Postwar Fate of einsatzstaf Reichsleiter Rosenberg Archival and Library Plunder, and the Dispersal of ERR Records", published in the same issue can be found on the ARCA blog on January 31. Currently, Russian museums are withholding art previously scheduled for travel to the United States for exhibitions due to a conflict over books and archives from a Jewish library now held in Russia. The Schneerson Library of 12,000 books assembled by the Chabad-Lubavitch Hasidic movement over two centuries was nationalized after 1917 and is held today in the Russian State Library in Moscow. Their related collection of 50,000 religious documents taken to Poland prior to World War II was stolen by the Nazis, and then found by the Soviet Army and taken to Moscow, where it has been held in secret for decades in the Soviet Union. ARCA's Managing Director Joni Fincham interviews Paul Brachfeld, Inspector General of the National Archives and Records Administration (NARA), in the fourth issue of The Journal of Art Crime. Paul Brachfeld began his career in the federal government with the United States Secret Service before transferring to the United States Customs Service and ultimately to the Treasury Department Office of Inspector General. After leaving the Treasury Department, Brachfeld served as the first Assistant Inspector General for Audits (AIGA) at the Federal Elections Commission. Directly prior to assuming his post at NARA, he was the AIGA of the Federal Communications Commission, Office of Inspector General. Brachfeld is responsible for establishing the Archival Recovery Team (ART), which focuses upon detection, investigation, recovery, and prosecution of missing and stolen holdings. Mr. Brachfeld discusses the creation of the Archival Recovery Team, social media, the tension between access and security, insider theft, and ways buyers can avoid purchasing stolen or fake historical documents or memorabilia. During the summer of 2009, as I went in and out of the Porta Romana a few times a day to go to class at ARCA's Postgraduate Program in Art Crime Studies, to eat at Punto Divino, to purchase fresh yogurt from the cheese shop, or to walk to the duomo at the top of this medieval hilltop town in Umbria, I, along with everyone else going in and out of historical Amelia, saw locals sitting to the entrance of town. Watching people or cars, as I've mentioned previously, is a past time in Amelia. I typically was too shy to say hello to the locals but on my last day in Amelia in 2009, I asked these gentlemen if I could take their photo and they consented. Grazie! In 2009, Dutch police found a painting at the railroad station at Amsterdam’s Schipol Airport. Martin Finkelnberg, head of the Arts and Antiques Crime Unit of IPOL, a department of the National Police Agency (KLPD), and Christopher A. Marinello, General Counsel with the Art Loss Register, discussed with ARCA how the police and the world's largest private database of lost and stolen art worked together to return Jacon van Ruisdael's painting, Two Men with Dogs on a Forest Path, to the owner who had misplaced it before boarding a train in Amsterdam. The Dutch Police organization consists of 26 police forces, of which 25 operate on a regional level. The 26th force, the Netherlands Police Agency (KPLD, Korps Landelijke Politiediensten) carries out nationwide taskes like policing or patrolling water, road, air and rail traffic; provides security for the Royal family, politicians and diplomats; and combats international organized crime with the National Investigation Squad. The KPLD also provides criminal intelligence, specialised investigation expertise and crime analysis on a national level, and is responsible for dealing with international requests for mutual assitance. The 17th century Baroque artist Jacob van Ruisdael (ca. 1628-1682) is often considered the greatest Dutch landscape painter. His works are found all over the world from the Hermitage in St. Petersburg, to the Louvre in Paris, and to regional museums in the United States. Obsessed with trees, he imbued them with forceful personalities, according to the online entry on the artist in the Encyclopaedia Brittanica. I asked Mr. Finkelnberg if he thought that the painting in a railway station had anything to do with a ransom. “No, nothing of the kind,” he wrote in an email. Recently I had published a post on the blog about Christopher A. Marinello’s essay in The Journal of Art Crime “On Fakes”, so I emailed Mr. Marinello at The Art Loss Register to ask him a few questions about the case. ARCA Blog: Mr. Marinello, the National Dutch Police credits The Art Loss Register with recovering the painting. Some people may think that the police and the ALR work separately. How did the ALR and the police approach this case? Mr. Marinello: While separate from law enforcement, the ALR enjoys a unique working relationship with local and international police organizations in an effort to solve and prevent art crimes. We are a free service to law enforcement officials who know that they can contact us for the most accurate and reliable information and documentation surrounding a theft while maintaining the highest level of confidentiality. 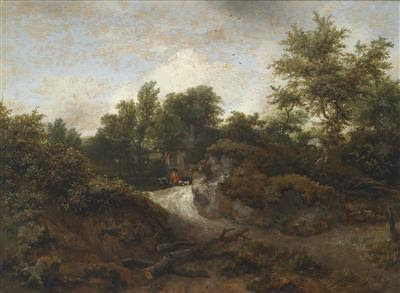 In this case, Martin contacted us to determine if the van Ruisdael was ever listed as stolen. We confirmed that the work was stolen property and provided the victim and case details along with the insurance documentation. The ALR never deletes its records and can access police reports and insurance information that may have been purged from police archives. ARCA blog: When I hear that the painting was recovered in a public place, such as a railroad station, I wonder if a ransom was paid. Is this typically true and was this the case here? Mr. Marinello: The ALR does not pay ransoms. It is strict ALR policy and always has been. On occasion, a theft victim or their insurance company will offer a reward for information leading to the recovery of a valuable item. In that case, we will effectuate payment of a reward but never to the criminal or anyone connected with the theft or where contrary to the laws of the local jurisdiction. ARCA blog: When the police are involved, what do you think the ALR can do that the police cannot? Mr. Marinello: I don’t want to give away anything that will reduce our effectiveness, but generally speaking, the ALR can operate more efficiently than law enforcement in areas of cross border communications, strategy development/implementation and cases where instant action is necessary. As a private organisation, we do not have the bureaucratic restrictions that one would associate with a governmental entity. But let’s get one thing perfectly clear, the ALR is serious about operating ethically and within the confines of local and national law. Martin Finkelnberg is one of the giants among international law enforcement in fighting art crime. Without officers like Martin Finkelnberg (KLPD), Jim Wynne (FBI), Michelle Roycroft and Ian Lawson (London Met. Police/Scotland Yard), Massimiliano Cretara and Fabrizio Rossi (Carabinieri), and Axel Poels (Belgian Federal Police), the art world would be a much more dangerous place. ARCA's Managing Director Joni Fincham interviews Martin Finkelnberg, Head of the Dutch Art Crime Team, in the fourth issue of The Journal of Art Crime. Mr. Finkelnberg has more than 34 years of experience in policing and investigating firearms, counter terrorism, questioned documents, counterfeit currency, and now, art crime. He leads the Dutch Art Crime Team which is part of The Netherlands Police Agency. Mr. Finkelnberg discusses art crime in The Netherlands, the role of the Port of Rotterdam, security at the many great art museums in The Netherlands, and to the average day for the Dutch Art Crime Team. The Detroit Institute of Arts posted its 6th video on Youtube of the series "Fakes, Forgeries and Mysteries." The director of DIA, Graham W. J. Beal, tells of how the museum recognized the beauty and workmanship of a 17th century painting, cleaned it up in the conservation lab, and then had it identified by the Louvre's former director Pierre Rosenberg who told the DIA officials, "I didn't know you had a Franz Pourbus". You can watch the video here. Pierre Rosenberg, the director of the Louvre between 1994 and 2001, specialized in 17th and 18th century paintings. Frans Pourbus the Younger (Netherlandish, 1569-1622) painted "A Man" in 1621 when the artist was 52 years old and a year before his death a year later in Paris. The oil on canvas is 31 7/2 x 25 7/8 inches (81.0 x 657.7 cm) and was a gift to the DIA by James E. Scripps. The painting had formerly been owned by the Earl of Hardwicke at Wimpole Hall in Cambridgeshire and sold at auction on June 30, 1888 To G. Smith. A year later, it was given by Mr. Scripps to the Detroit Museum of Arts. James Edmund Scripps, the American publisher and philanthropist, founded The Detroit News and was the brother of Ellen Browning Scripps who founded Scripps Institute of Oceanography in La Jolla and Scripps College in Claremont, CA. Reconstruction of the current Porta Romana began in 1592 and took 47 years. However, the brick sentry box dates from the 14th century. The plaque above the arch honored Santa Maria Assunta in 1703 after a big earthquake left the historic center unharmed and devastated the surrounding area. The town's coat of arms is a blue shield embossed with the letters, APCA, topped by a royal crown, and followed by two braches of faro (also known as spelt). The ancient wood door is closed for a few minutes every August on a Saturday evening during a medieval procession of town members in wool costumes that commemorates the Statuti Amerini which turned this formerly free town into a papal city. Where a drawbridge used to defend the town during the Middle Ages, a ditch is now filled with dirt and plants. A drawing of the town in 1700 shows the drawbridge at the Porta Romana and all the other buildings seen today, including the walls of the garden of the Palazzo Farrattini. Outside the gate today is a round mirror set at an angle for car drivers and pedestrians to see around the corner to pass safely into town. To the south, the Porta Romana opens onto the Piazza XXI Septembre, the busiest intersection in town with four roads leading to other parts of Umbria such as Orvieto, Terni and Narni, Orte, and as far as Roma. An apartment above the arch of the Porta Romana opens its windows north into the historic center onto the shops lining Via della Repubblica. 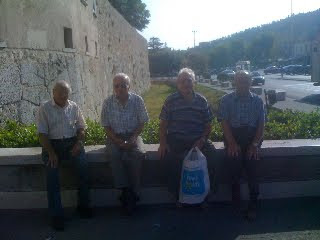 Tomorrow I will post my favorite photos of a few of the local men sitting on the wall adjacent to the Porta Romana. They sit in the sun, talk, and watch the world go by. And although they had never smiled at me all the day I ran in and out of the Porta Romana, they smiled for the camera when I asked and I am quite fond of the photo -- and of course, them. Last summer in Amelia two students from ARCA's Postgraduate Program found the setting inspirational and formed a new musical group. Classical Twist is a duo of classically trained musicians, proving that lawyers can also be artists. Leila Amineddoleh (piano) and Daniella Fischetti (violin) were students in ARCA's class of 2010 when they met and discovered that they were not only interested in the same legal fields, but that they were also both musicians. While enjoying an outdoor wine-tasting and dinner, they chatted about music and soon realized that they had mutual admiration for many of the same artists. Leila, a classical pianist, and Daniella, classical violinist turned bluegrass/jazz fiddler, found common ground in Beethoven and Radiohead and got to work immediately. After five weeks of early morning rehearsals, picking apart a classical sonata and arranging the complexities of modern rock, the duo performed a recital in Palazzo Petrignani. Beneath a veil of frescoes with the sound of church bells echoing across the Umbrian hillside, they presented Beethoven's Fourth Violin and Piano Sonata, Radiohead selections, and a couple of Neapolitan street songs (to the delight of their Italian friends) to their fellow classmates, instructors and residents of Amelia. The recital was a hit, and due to popular request, the duo performed two weeks later in Palazzo Venturelli. After a fabulous summer of playing music together in beautiful Amelia, the duo was sad to "break up the band." As luck would have it, Daniella and Leila both live in the New York metro area, and they reunited in the US after their summer abroad. The duo has continued to expand their repertoire, and they have a rapidly growing playlist of classical pieces, tango, traditional folk songs, and music by David Bowie, Portishead, the Gotan Project, the Beatles, and many others. Ironically, one of the most difficult tasks facing the girls was creating a suitable name for the group. After months of debate, Daniella and Leila finally agreed on "Classical Twist," inspired by their classical training, fancy cocktails, and their own personal "twist" that they give songs. Since returning from Italy, Classical Twist has performed at private parties, holiday functions, and restaurants and have a number of performances lined up this spring. Daniella and Leila look forward to continuing to share their love of music and are working on a number of albums to share with their fans. 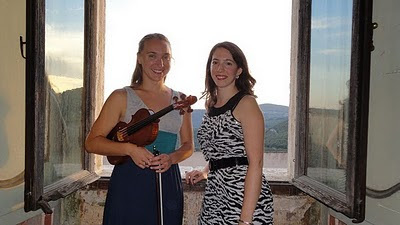 Playing together reminds the girls of their wonderful summer adventures in Umbria, Italy, a place filled with beautiful art, delicious food, musical memories, and wonderful friends. To learn more about Classical Twist and hear samples, please visit http://www.myspace.com/classicaltwistmusic, and stay tuned for www.classicaltwistmusic.com- new site coming soon! The Journal of Art Crime: James Charney Reviews "The Billionaire's Vinegar"
In the fourth issue of The Journal of Art Crime, James Charney reviews "The Billionaire's Vinegar" (Three Rivers Press, New York 2009) by Benjamin Wallace. In 1985, Christie's auctioned off a Bordeaux wine alleged to have belonged to Thomas Jefferson to Malcolm Forbes for $156,000. "The Billionaire's Vinegar" is a look at the sale of old wines. The issue, of course, is authentication. Dr. James Charney is a psychiatrist and advisor at the Yale University Medical School. My ARTINFO email subscription brought another interesting story to my attention yesterday. A German online website, Deutche Well, reported that a woman had donated a painting by Claude Monet more than two decades ago, sworn the curator to secrecy, and wouldn't let the gallery show the work until after her death. This would be the sixth Monet held by the institution and they feel it's authentic; however, does this painting belong to someone else? The Monet is apparently in good condition so why the secrecy? Read both the articles in ARTINFO and Deutsche Welle and be curious with me. A building in Moscow once used by oligarch-in-exile Boris Berezovsky that housed an illegal gambling syndicate was raided Friday by the Russian Federal Security Service. Along with documents supposedly linked to offshore businesses owned by Berezovsky and his family, investigators discovered artworks by Picasso and Rembrandt said to be worth over $5 million. Neither ARTINFO, or Bloomberg, or The Moscow Times, the original source of this story, identified the paintings. 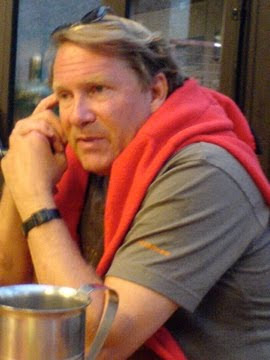 Investor Brois Berezovsky is an associate of art collector Roman Abramovich. Berezovksy, ARTINFO reports, "no longer uses the Moscow building, however, and hasn't for some time: He fled Russia in 2001 and received political asylum in Britain. Whether the paintings discovered in the illegal den were also being traced back to Berezovsky, or were connected with the gambling operation was not clear from initial reports." Which paintings were found, where did they come from and how did they get to Moscow? Stolen or purchased? Why would someone leaving the country leave behind a valuable Rembrandt or Picasso artwork? The information here is too vague to make any conclusions but it raises my curiosity. The Journal of Art Crime: Stefano Alessandrini reviews "Ancient Art Works Recovered by the Guardia di Finanza Exhibition"
In the fourth issue of The Journal of Art Crime, Stefano Allessandri reviews "Ancient Art Works Recovered by the Guardia di Finanza Exhibition" in Vittoriano, Rome (14 June - 12 September 2010). The Guardia di Finanza's Archaeological Heritage Protection Group collaborated with the Ministero dei Bene Culturali (Heritage Ministry) to curate "From the Tomb to the Museum: Stories of Looting and Recoveries" last summer at the Complesso del vittoriano at Piazza Venezia in Rome. 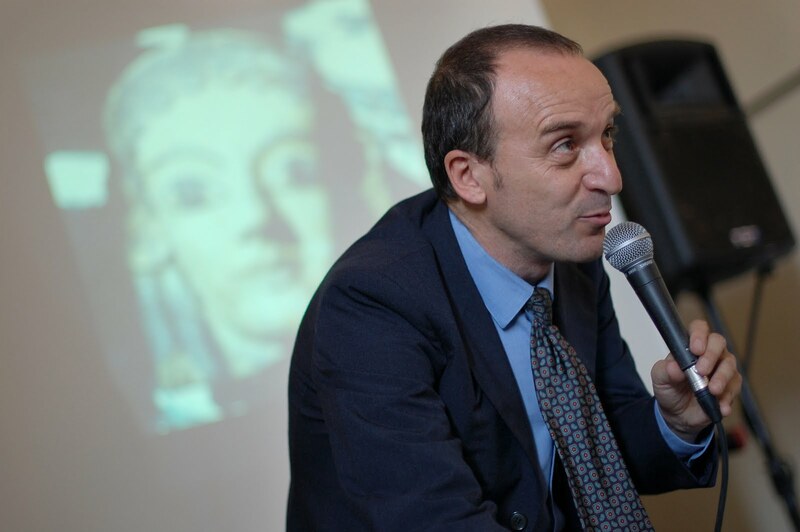 Stefano Alessandrini is head of Italy's Archaeological Group and adviser to the Ministry of Culture and the Advocate General of Italy on the recovery of looted antiquities. 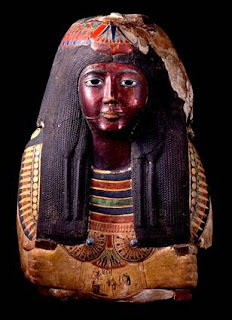 Questions have arisen about the legal status of an 3,200 year-old Egyptian mummy mask from a noblewoman at the court of Ramses II that has belonged to the St. Louis Art Museum for more than two decades. 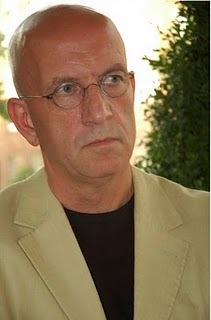 Ton Cremers, security consultant, and operator of the website news service, Museum Security Network in The Netherlands, is mentioned in the lawsuit that cites numerous emails Mr. Cremers sent to government officials in 2005 and 2006 call for an investigation, according to Mann. Anybody who has read Peter Watson's books, Sotheby's The Inside Story and The Medici Conspiracy, knows that the Swiss route should be distrusted. The Aboutaam fake provenance was very easy to unmask because the Swiss collector mentioned by them in the provenance had never heard about this mask. According to the ICOM deontological code, no museum should keep stolen objects, no matter any legal context. There is a knack in this case: the Saint Louis Art Museum is not a member of ICOM and apparently does not mind the ICOM ethical code. If they had been an ICOM Member, they should have been thrown out of this organization immediately. It is an outright lie that they performed due diligence when achieving this mask, for they did not. In my view, Brent Benjamin, the director of the SLAM, is nothing else than an outright buyer of stolen property (yes, I am aware that his predecessor actually bought the mask). His standpoint is that Egypt must prove that the Ka-Nefer-Nefer mask was stolen. That is putting the world upside down. One thing is sure beyond any doubt: The mask was not excavated in Missouri. The Ka-Nefer-Nefer mask must return to Egypt as quickly as possible. ARCA blog: Is it appropriate to mention your emails in the lawsuit and how will this impact the Museum Security Network? Ton Cremers: I really do not know who quoted my 2005 - 2008 messages about the Ka Nefer Nefer mask in the present law suit. As far as I am concerned there is no objection against using my messages since all of these have been sent publicly. Using these messages will not have any impact on the Museum Security Network. At least not any negative impact. It really shows that the MSN is regarded as a very serious factor in the struggle against illicit trade in cultural goods. The SLAM argues in the complaint that the relevant U.S. government officials had knowledge of the potential claim over five years ago, and the five-year statute of limitations period has expired under 19 U.S.C. § 1621. A court will decide whether these emails, and queries the Museum sent to INTERPOL in the 1990's about the mask are sufficient to have given the U.S. government actual or constructive knowledge of the potential claim. The Museum seeks a declaratory judgment under the Tariff Act that the action is barred by the statute of limitations. In the fourth issue of The Journal of Art Crime, essayist Patrick Hunt writes about theft to medieval vellum pages in “Missing Miniatures from Priceless Illuminated Manuscripts” even at monasteries situated in the Swiss Alps and in cave sanctuaries in Nepal. Patrick Hunt has followed “several of his life-long dreams” – archaeologist, art historian and author – “for the last 20 years at Stanford University”, starting as a Visiting Scholar in 1992 and teaching regularly since 1994. He has directed Stanford’s Alpine Archaeology Project since 1994 and publishes on a wide variety of subjects, from archaeology to art history and related humanities topics. ARCA blog: Dr. Hunt, you write in your essay that in Bangkok a publisher of a book recording Nepalese religious art thefts was robbed in 1986 of 80 original photographic slides that evidenced the destruction of art. Can you guess as to the motivation of the thieves? Do you often think that they have no shame? 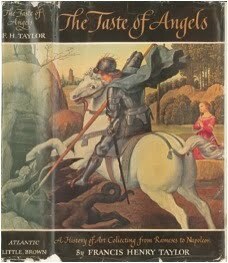 Or can you imagine that the sale of stolen art is so great that no wonder these items are stolen? Dr. Hunt: I wish an appreciation for beauty motivated such wanton destruction in the case of Nepalese religious art, but as usual in art theft, greed for highest profit margin seems unmitigated by respect for cultural treasures in their rightful contexts, however remote. In Bangkok, it was likely the associates of the thieves who wanted to remove any evidence of a crime having been committed so authorities would have a tougher time proving provenance as well as to facilitate sale to unsuspecting buyers for a “clean bill of health”. Organized crime – hidden behind “professional” moles - may often be involved, but the trite adage still applies: if no demand existed, supply would shrink accordingly. In some cases, the desire to collect something exotic that may even remind one of a wonderful trip may generate a legitimate desire to purchase a sentimental keepsake of distant travel, but these are not applicable motivations when thieves shamelessly rip religious art out of shrines solely for resale several continents away. For me, the clue that organized crime was involved in Svayambhunath was the murder of the priest trying to protect the site. Collecting is full of such shoals, so caveat emptor. If most collectors, usually decent people, only knew the trail of blood, they would generally shy away, and criminals know this. Plus, unfortunately provenance is simple to fake unless would-be collectors spend a lot of money to verify their sources. ARCA blog: You cite one of the most “egregious gangster-like robberies” as the 2004 assault with a stun gun on a rare books librarian at Transylvania University Library that ended with the theft of rare books valued between $500,000 and $750,000 and the arrest of four college students who were apprehended when they tried to sell the material to Christie’s auction house in New York. This case, you say, was “ludicrously amateur” – what motivated these college students to do something like this? Were they prosecuted and jailed? What are the consequences for book theft? Dr. Hunt: These four college kids – all of 20 years old - were just plain stupid. I don’t want to systematically categorize such acts as frathouse follies although it’s tempting in this caper. This kind of brazenness can at times be pinpointed to alcohol-emboldened macho dares, and such perpetrators are commonly puerile males who were either never caught or substantively punished for lesser pranks. But it’s still an amoral response to cultural relativism to think a rare library collection is fair game. In this case, they were unlikely to be intellectuals who knew the books well; they were not young academics who normally fully respect public opportunity to use resources within a library, where special collections are also conserved and cared for rightly. But they did get caught, thanks to their inability to foresee that reference librarians are well-educated people who know how to do their research. Plus, having assaulted the librarian with a stun gun added incentives to catch them when they rashly impersonated known book dealers in communications with Christie’s. After pleading guilty, they were ultimately each sentenced to 87 months in December, 2005. ARCA blog: You write that in 1995 an honored medieval professor researching at the Vatican Library cut out several illuminated 14th century leaves with fine miniature paintings from a Vatican codex that had been commissioned and annotated by Petrarch. Is it only about the money? Dr. Hunt: Unlike the college students, this 1995 theft is probably more complicated. Here, a true bibliophile, a respected medieval studies professor who knew the material better than nearly anyone in the world, lapsed into a form of early dementia at age 68. It reminds me of a fascinating book by an author acquaintance, Allison Hoover Bartlett's The Man Who Loved Books Too Much: The True Story of a Thief, a Detective, and a World of Literary Obsession (Riverhead Books, New York, 2009). Obsession and even emotional hardship can drive otherwise moral people to do horrible things that would normally be unthinkable to them. Here in the case of Professor Anthony Melnikas, motivation is still largely a mystery, but it doesn’t seem to be entirely about money even though the priceless Petrarch leaves ended up with a book dealer before being spotted and returned to the Vatican. His likely dementia does not in any way excuse the crime, and we should hold such scholars who have almost unlimited access to an even higher responsibility. ARCA blog: You tell of $750,000 book theft from Harvard, $1 million stolen from books at University of California at Los Angeles, and that many more books have probably been mutilated but are still unaccounted. Recovery is dependent upon perusing likely dealers and even antiquarian book fairs where such missing medieval art may turn up. If one of our readers sees something suspicious, what steps should be taken? Dr. Hunt: The first step I recommend is to contact the parent body of this blog, ARCA (Association for Research into Crimes Against Art), as well as the ALA (American Library Association) because they regularly report library thefts once recognized. The second step might be to contact the FBI if it involves any possible element of organized crime, which sadly is already deeply involved, especially in art theft for money laundering. But I urge anyone in the latter instance to be very careful because crime cartels show little value for human life and snoopy people can disappear. Alert the right authorities and then get out of the way. The major auction houses are doing more due diligence these days, so less visible places might be venues where stolen rare books turn up more readily. The old canard about suspiciously low prices for rare books or possibly purloined medieval illuminations cut out from their pages, like anything else, is apropos: if it seems too good to be true, it probably is. In my Stanford courses like “Plundered Art” and in my books and articles, I find the forensic side fascinating but as always, truth about human behavior is ever more strange than fiction. Even if it’s less than 0.1% of the population who perpetrate brazen art crimes, one of my great mystery crime author friends, Ridley Pearson, reminds that you just can’t as easily make this stuff up. Justice may be slow, but unlike melted-down gold and silver, if the work is not destroyed – which would be totally counter-productive - the book trail can usually be followed. In an essay entitled “The Paris Art Theft, May 2010,” Catherine Schofield Sezgin relates the events of the theft of the Musée d’Art Moderne de la Ville de Paris in the 16th arrondissement in Paris and speculates about how the thief may have stolen five paintings. Christophe Girard, deputy culture secretary in Paris, estimated the value of the stolen paintings at 100 Euros ($123 million). The five missing paintings are reported as: “Le pigeon aux petits-pois” (The Pidgeon with the Peas), an ochre and brown Cubist oil painting by Pablo Picasso worth an estimated 23 million euros; “La Pastorale” (Pastoral), an oil painting of nudes on a hillside by Henri Matisse about 15 million euros; “L’olivier prés de l’Estaque” (Olive Tree Near Estaque)by Georges Braque; “La femme a l’eventail” (Woman with a Fan) by Amedeo Modigliani; and “Nature-more aux chandeliers” (Still Life with Candlesticks) by Fernand Leger. According to Paris’ mayor, Betrand Delanoe, the museum’s security system, including some of the surveillance cameras, has not worked since March 30 and has not been fixed since the security company is waiting for parts from a supplier. "In 2009, early January, I was ending a two-week holiday in Paris. We had been staying next door to the Musée d’Art Moderne de la Ville de Paris but had not been inside it. On Saturday evening, the night before leaving, I left my children in the apartment and walked next door to check out the permanent collection which was free. The museum would be closing in a few minutes. I headed downstairs and started looking at paintings, somewhat sure that after days and days in Paris at the Musee d'Orsay and the Louvre and the Musée National d'Art Moderne at the Centre Pompidou that there wasn't much more for me to see in such short time. And then I saw this painting of trees that amazed me, and discovered that it was by Braque, titled, in English, Olive Tree Near Estaque. I just loved it and am happy to share these photos now." -- Catherine Schofield Sezgin. "The researchers found that a change in the oxidation state of the element chromium (from chromium 6 to chromium 3) was linked to the darkening of chrome yellow paint." 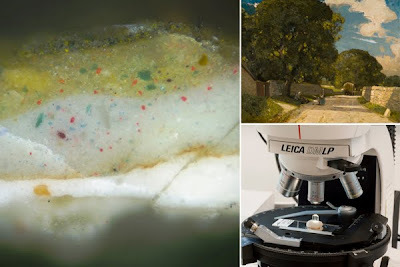 For more information, read the complete article ("Van Gogh paintings 'degraded by UV-driven reaction'") on the BBC here. The Detroit Institute of Arts released its fifth podcast on YouTube, "Hello to Tewkesbury Road" to augment the exhibit, "Fakes, Forgeries, and Mysteries." Dr. Salvador Salort-Pons, Associate Curator of European Paintings, narrates the story of the painting, "Three Figures Resting Under a Tree," once attributed to Claude Monet. 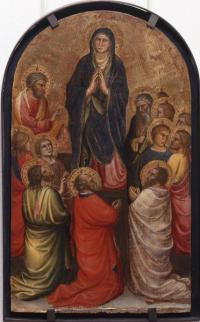 The painting came into the collection at the DIA in 2004 and for this exhibit, the museum decided to look further into the authenticity and provenance of the work. First, Dr. Salort-Pons explains, they conducted a technical analysis of the materials used such as the pigments, the canvas, and the stretcher and found the materials to be consistent with those Monet would have used in 1871, the date attached to the signature on the front of the painting. 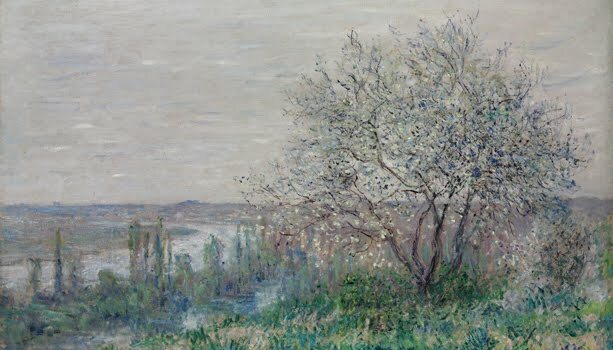 The style of the painting did not look like an Impressionist painting by Monet but his signature was on the front and the back of the painting but it is dated from a period when Monet not an Impressionist painter. "He was still young and profiling his artistic personality," Dr. Salort-Pons explains. They looked at the back of the painting to try to find more information about it, Dr. Salort-Pons continues, and discovered a stamp that said it had been exhibited at the Carnegie Museum of Arts in Pittsburgh. He asked them if they had displayed Monet's "Three Figures Sitting Under a Tree" in the past but they did not find any evidence in their records. On the back of the painting, they found the number "83707" which they recognized from an art dealer in New York where they traveled and found a card file with the history of ownership of this painting which had been sold by the Parisian dealer Goupil & Cie in the beginning of the 20th century then sold as a painting by Monet in 1947. The card file identified the title of the painting as "Tewkesbury Road." With this new information, he went through the exhibition files at The Carnegie Museum of Art and found a photo of the painting from an exhibition in 1910 but the artist's signature on the painting was of Sir Alfred East. Apparently, between 1910 and 1947, someone had removed East's signature, forged Monet's signature, and fabricated the provenance. The forger knew in 1871 Monet was in England, the location of Tewkesbury Road. 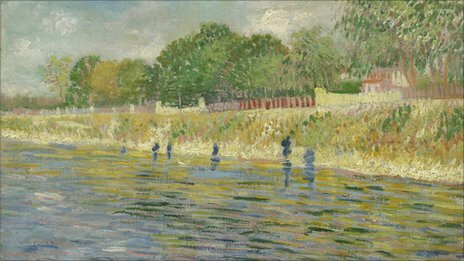 This painting is not by Monet but Sir Alfred East and Dr. Salvort-Pons tells the story of how an art researcher's hopes are challenging while investigating a piece of art. The Journal of Art Crime: Essayist Kim Alderman on "The Ethics of Context"
Kimberly Alderman is a Clinical Assistant Professor at the University of Wisconsin Law School. She recently completed the ARCA Postgraduate Program, and writes a blog: http://culturalpropertylaw.wordpress.com/. Amelia, the oldest town in Umbria, is about 60 miles north of Rome. You can get there by car in about an hour. You could get there by train to the station at Orte, in either one or two hours from either Termini Station in Rome or from the airports, depending on whether or not your train stops at every town. 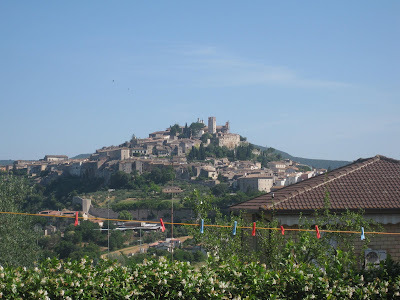 Orte, a another small medieval town, is about nine miles from Amelia through beautiful green hills with cypress trees. If you don't have a car, you can take a bus, unless you arrive on a Sunday in July or August, or later than 10 o'clock at night, then you will have to call for a driver. Outside the doors of the train station, a sign indicates a phone number for a taxi company. But the taxi company, or just a sole driver, I've never figured out which, does not always answer the phone or send a car. So it's helpful to have the name and number of a private service that will agree to meet you upon your arrival for the cost of 25 or 30 euros. As I've discussed before, most visitors stop at Bar Leonardi for refreshments or to make arrangements to reach their lodgings. 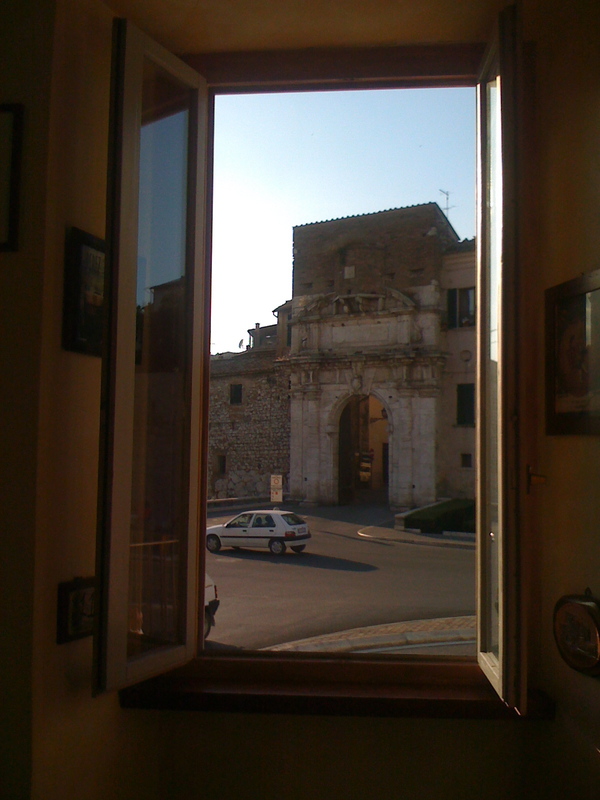 From the patio of Bar Leonardi, you can sit at a table and view the walls of the medieval town and the main gate which is known as the Porta Romana. This entrance deserves a photo and a blog of it's own so we'll just say for now that if you're not waiting on the patio of Bar Leonardi, you're waiting on a low wall that extends outside of the Porta Romana. And I have a photo which I will also show in another blog of some local men that agreed to have their photo taken. They, or someone like them, sat on that wall most morning and evenings. However, the sitting wall is typically available during the afternoon siesta so I recommend that when you want to feel like a local and check out all the cars and pedestrians going in and out of the historic center, that you first sit on the wall during a hot afternoon when no one else is around. Because you'll want to make sure you have the right detached pose ready as you inspect everyone and everything going in and out of that town. People may have lived on this hilltop for three thousand years, allegedly beginning with the Umbrian King Ameroe more than 300 years earlier than the settlement of Rome. The Umbrians traded with Greeks and Etruscans and produced pottery. Pliny the Elder, historian and military commander, wrote that the Umbrians were the oldest people in Italy -- that the Greeks called them 'Ombrici' because they were believed to have survived the great flood Zeus unleashed to cleanse the countryside at the end of the Bronze Age to express his anger with the corruption of the Pelasgians. This history is relevant when you're in Amelia because you can feel the sense of pride and tradition in the town's clean streets and well-preserved buildings. Between the 6th and 4th centuries B. C., the Etruscans protected Amelia by stacking limestone blocks, one on top of the other, fitting them together without mortar. These walls, 8 meters high and 3.5 meters wide, extend around the town for more than 700 meters. One legend claims that these walls thwarted an attack by Emperor Federico Barbarossa. A 30-meter segment of this wall collapsed in 2006 and is still under repair as the town awaits for government funding and tries to figure out how to duplicate the original construction. In May 2008, another gate opening from the third of fourth century B.C. was rediscovered.